Dr. Coplan continues his discussion of a new paradigm for thinking about ASD. 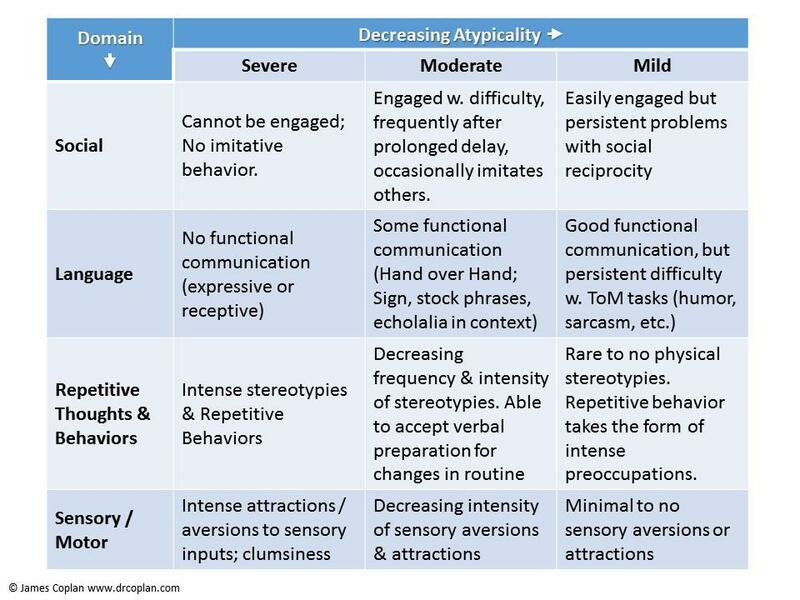 Here is a table that presents a thumbnail sketch of degrees of severity in what I regard as the four principal domains that define ASD. I could have added dozens of specific items in each cell. This condensed version is just meant to give the flavor of what I’m talking about. I am well aware that DSM5 attempts to reduce ASD to two domains: “Language & Social,” and “Repetitious Behavior,” but this is an over-simplification. Language and social development are closely correlated statistically (which is why the authors of DSM5 lumped them together), but they are in fact separate domains, neurologically and developmentally. Lumping these two sets of behavior into one category (a) limits the richness of our description of what’s going on, and (b) negates what we’ve learned over the past 150 years about the functional neuroanatomy of the brain. 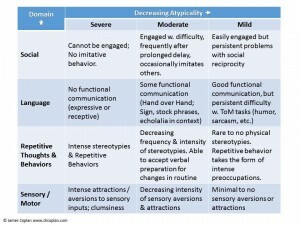 DSM5 also relegates sensory and motor issues (exaggerated or blunted responses to sensory stimuli; clumsiness) to a sub-category of “Repetitive Behavior,” rather than elevating them to a category all their own. (Perhaps this is because psychiatrists view themselves as concerned with “things of the mind,” whereas sensory reactivity and fine motor clumsiness seem to be mere “things of the body.” As one researcher has observed, however, “altered connectivity and action model formation in autism is autism.”  Emphasis added). So I continue to describe autism in terms of four domains: Social, Language, Repetitive Thoughts and Behaviors, and Abnormal Sensorimotor Processing. 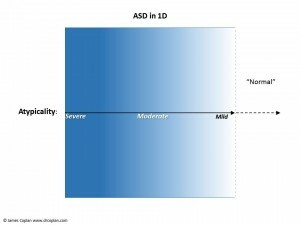 Ultimately, however, whether we define ASD by two, three, or four domains doesn’t impact the validity of my model. Table 1. Degrees of Atypicality in four domains (social, language, repetitive thoughts & behaviors, and sensory). “ToM” = “Theory of Mind.” The ability to infer the inner mental state of others. See Coplan, 2010 for details. Now I’m going to intentionally commit an over-simplification myself: I’m going to “blenderize” Table 1, and condense everything into one simple figure, which I’ve called “ASD in 1 Dimension” (Figure 1). The intensity of the blue shading represents the severity of the atypicality: dark blue on the left, fading as we move to the right. I’ve added a horizontal axis, labelled “Atypicality” – Severe, Moderate, and Mild. Notice the dotted arrow that continues to the right, extending beyond the boundary of the figure itself. This is to signify that atypicality doesn’t suddenly fall to zero at the right-hand boundary of our 1 dimensional image of ASD. Rather, atypicality continues on, at a milder level, into the “normal” or “neurotypical” population. Keep Figure 1 in mind. We’ll come back to it in a bit. But first I need to expand our frame of reference, by talking about something unrelated to ASD: General Intelligence.